A Tramp Abroad comprises volumes 9 and 10 of the Gabriel Wells Definitive Edition of Mark Twain's works. Hugh Seymour Walpole, one of the most prolific writers in the 1920s and 30s, wrote the Appreciation for this edition. Walpole was born in New Zealand in 1884, the son of Reverend G. H. S. Walpole who later became Bishop of Edinburgh. 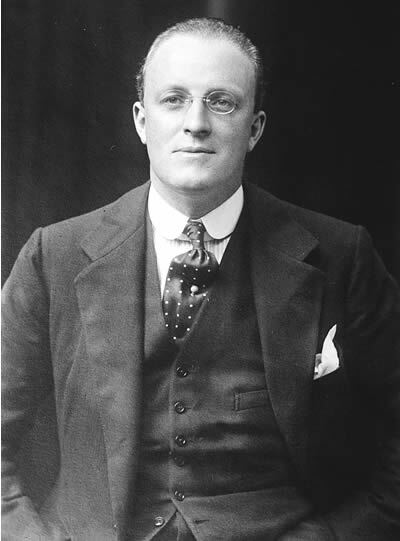 Hugh Walpole attended boarding schools in England including King's School at Canterbury and later Emmanuel College in Cambridge. After abandoning a short career as a minister he became a private tutor and teacher before turning to writing. His first novel The Wooden Horse was published in 1909. Thereafter, he wrote almost a book a year until his death. When World War I broke out. Walpole joined the Imperial Russian Red Cross and earned awards for bravery and valiant actions in removing wounded soldiers from the front lines After the war, Walpole became a frequent visitor and lecturer in the United States. For a while he settled in Hollywood, California until the outbreak of World War II when he returned to England. Walpole's Appreciation for A Tramp Abroad was written while the horrors of World War I in Europe were still fresh in his memory. IT was in March, 1878, that Mark Twain took his tramp through Europe, and now when in 1923 one reads again that old chronicle, the surroundings now so different that a mind more sophisticated sees his pictures not only with the eyes of expectant and credulous youth, but also with some knowledge of the countries that he describes, there might well be for one a kind of pathos, an all-pervading sense of a changed world and a youth relinquished. There have been many travellers since Mark Twain. Flying machines and motor cars, telegrams and telephones, have brought the world so close to one's door that the first sense that one has when rereading this book is that one is revisiting a haunt of ancient peace absolutely impossible now for any tired and over-nervous traveller. The author of this book was having experiences that many, many travellers have had since, and they seemed to him at the time and to his first readers the last word in modern adventure. He would never have suspected that fifty years after it would wear so prim an aspect and that all the veils and encumbrances of the later years of the Good Queen should haunt those travellers to the very deeps of the farthest fastnesses. That very primness now gives this book an added charm. The book rings so absolutely true in its whole social picture. And what of the humor? How has that lasted? There are certain passages, as, for instance, the famous one of the author and his friend getting up in haste to see the sunrise and finding it, to their surprise, a sunset, which are now so historical that they read a little like the Declaration of Independence. We know every word of them, every turn of every phrase. So it is that most of the humor in this book comes to us with something of the pathos of some tune that we loved years ago and suddenly hear once again. St. Mark's is perfect, and it soon grew to be so noble, so ugly, that it was difficult to stay away from it even for a little while. Every time its squat domes disappeared from my view, I had a despondent feeling; whenever they reappeared, I felt an honest rapture. I have not known any happier hours than those I daily spent in front of Florian's, looking across the Great Square at it. Propped on its long row of low, thick-legged columns, its back knobbed with domes, it seemed like a vast warty bug taking a meditative walk. That was the fashion in which 1870 looked at St. Mark's and it doesn't any longer seem very amusing. And yet how alive and virile that picture is! Indeed, on reading this book again it is not an impression of humor that one mainly gets. There is always behind the fun of Mark Twain, even in that perfect masterpiece Huckleberry Finn, a note of sardonic sadness. He never, as do some humorists, moved so far away from real life that he peddled his veracity for an extra joke. His point of view was odd, unusual if you like. He saw things, as in the famous ascent of Mt. Blanc by telescope, that nobody else could ever see. But what he wanted to tell was the truth at every cost. His attempts in this book to put precisely on paper what he saw are very striking. Could anything be better than this, for instance, as an absolutely detailed description of something seen? Presently the moon rose up behind some of those sky piers, fingers or pinnacles of bare rock of which I have spoken. They were a little to the left of the crest of Mt. Blanc and right over our heads, but she could not manage to climb high enough toward heaven to get entirely above them. She would show a glittering arch of her upper third, occasionally, and scrape it along behind the comblike row; sometimes a pinnacle stood straight up, like a statuette of ebony, against that glittering white shield, then seem to glide out of it by its own volition and power and become a dim specter, while the next pinnacle glided into its place and blotted the spotless disc with the black exclamation point of its presence. The top of one pinnacle took the shapely clean cut form of a rabbit's head, in the inky silhouette, while it rested against the moon. Can it be that our point of view of Twain has changed so entirely in these fifty years that he is becoming to us more valuable as a poet and a philosopher than as a humorist? A Tramp Abroad certainly cannot seem to any modern reader any more mainly a funny book. It is a book of almost horrified contact, the new civilization against the old. Whether it be the duelling in Germany, the sunrise on the Rigi, or the iniquities of the European Courier, there is always this same mixture of surprised touching love for the beauty of the world, indignation against injustice, and an intense patriotism. Seen through the intervening years, this book gains immensely in nobility, in honesty, and has a poetic color in its pages that its own generation, I fancy, scarcely realized. WHEN the Tramp Abroad appeared from the press in March, 1880, it had been something more than three years since the publication of Mark Twain's preceding book, The Adventures of Tom Sawyer. He had not been idle during that period; he had engaged in a number of literary and dramatic undertakings, but without conclusion, or, at least, without complete success. There was a feeling, not only in his own mind, but in that of his publisher, that it was time for him to write another book of travel. It had been twenty years since the Quaker City excursion, and the larger portion of the continent Europe still remained for him to explore, and to report in his characteristic fashion. Clemens was willing to visit Europe, though his desire for travel was no longer keen, as in those earlier years. He knew he would see with older and more sophisticated eyes, and that he would be likely to write accordingly. But perhaps the book would be all he better for that reason. So the big house in Hartford was closed, and on April 11, 1878, the Clemens family, accompanied by a school friend of Mrs. Clemens* sailed on the Holsatia for Hamburg, Germany from whence, with little delay, they proceeded to Heidelberg, where, in the beautiful Schloss hotel overlooking Heidelberg castle, they prepared to spend the spring and early summer. Lord! how blessed is the repose, the tranquillity of this place! Only two sounds: the happy clamor of the birds in the groves, and the muffled music of the Neckar, tumbling over the opposing dikes. It is no hardship to lie awake awhile nights, for this subdued roar has exactly the sound of steady rain beating upon a roof. It is so healing to the spirit; and it bears up the thread of one's imaginings as an accompaniment bears up a song. He was too happy to work, at first, but the "call" came by and by, and he began writing some of the Heidelberg chapters. The real "tramping, " however, did not begin until later. Before leaving Hartford he had arranged with his friend and spiritual counselor, the Rev. Joseph Hopkins Twichell, to join him in a pedestrian tour through lower Germany and Switzerland. It was arranged that Twichell should arrive the first of August; meantime Mark Twain would mature plans for the book and improve his German, which would appear to have needed it. The struggle with the "awful German language," in fact, became a sort of nightmare. Once, in his note-book, he wrote, "Dreamed that all bad foreigners went to German heaven; couldn't talk, and wished they had gone to the other place," and a little further along, "I wish I could hear myself talk German." He also records how two Germans, strangers in Heidelberg, asked him a direction, and when he had given it in the most elaborately correct German he could muster, one of them merely raised his eyes and ejaculated, "Gott im Himmel!" Twichell arrived, and they immediately set out on a tramp through the Black Forest, excursioning as pleased them, and having an idyllic good time. They did not always walk, but they often did; at least, they did sometimes, when conditions were favorable. But they were likely to take a carriage, or a donkey-cart or a train, or any convenient thing that happened along. They did not hurry, but idled and talked and gathered flowers and gossiped with wayside natives and tourists, though always preferring to wander along together, beguiling the way with speculation and discussion and entertaining delays. They crossed over into Switzerland and considered the conquest of the Alps. The family followed by rail or diligence, and greeted them here and there when they rested from their wanderings. In the Tramp Abroad, Twichell is "Harris," and some of the incidents in that book are approximate history -- only approximate, however, for Clemens, realizing that the highways of Europe were well worn in literature as well as in fact, gave much freer rein to his tendency to elaboration than in his earlier book of travel. Well, time and again it has seemed to me that I must drop everything and flee to Switzerland once more. It is a longing -- a deep, strong, tugging longing. That's the word. We must go again, Joe. In truth, I don't ever seem to be in good enough humor with anything to satirize it. No, I want to stand up before it and curse it, and foam at the mouth, and take a club and pound it to rags and pulp. I am as soary and flighty as a rocket to-day, with the unutterable joy of getting that Old Man of the Sea off of my back, where he has been roosting for more than a year and a half. We had a mighty good time, Joe, and the six weeks I would dearly like to repeat any time, but the rest of the fourteen months, never! It is mainly the story of the "six weeks" that he has told for us, and the tale, translated into many languages, has delighted, and still delights, a worldwide army of readers. * Clara Spaulding, later Mrs. John B. Stanchfield. The Gabriel Wells Definitive Edition of A Tramp Abroad divides the work into two separate books. Volume 9 ends with what was originally Chapter 29 of the first edition. Volume 10 begins with new chapter numbering and what was once Chapter 30 from the first edition is Chapter 1 of Volume 10. The division is the same that was first utilized in the 1899 uniform editions from American Publishing Company. The Gabriel Wells Definitive Edition of A Tramp Abroad retains the frontispiece portrait of Clemens etched by W. H. W. Bicknell and illustrations by Thure de Thulstrup from the 1899 uniform editions from American Publishing Company. Illustrations for Volume 10 are those that were previously included in the 1899 uniform editions from American Publishing Company with "Climbing the Riffelberg" selected for a frontispiece. "Heart Attack Takes Walpole," [Portland] Oregonian, 2 June 1941, p. 2. "He 'Wrote As He Breathed,'" The New York Times, 2 June 1941 p. 17. "Hugh Walpole," [Portland] Oregonian, 6 June 1941, p. 10. "Hugh Walpole, Novelist, Dies in England," Dallas Morning News, 2 June 1941, p. 1.